Syncfusion is excited to share details about the new features and enhancements for our file format libraries that have been included in the Essential Studio 2018 Volume 3 release based on your valuable feedback. 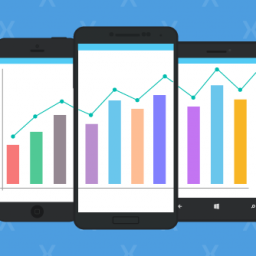 Syncfusion’s file format libraries allow users to create, edit, write, and convert Excel, PDF, Word, and PowerPoint files in .NET Framework, .NET Core, Xamarin, and UWP applications without the need of Microsoft Office or Adobe dependencies. 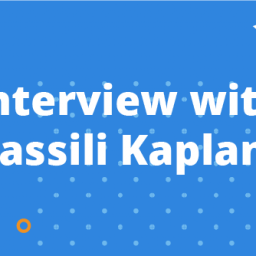 In this blog, let’s see the new items included in the 2018 Volume 3 release of our file format libraries. Essential PDF allows you to add complex script language (Devanagari, Tamil, Hindi, Thai, etc.) 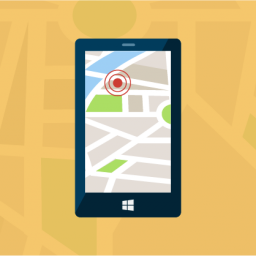 text support in PDF documents in any .NET application. The following code example shows how to draw complex script (Thai) text. //Set the font with Unicode option. 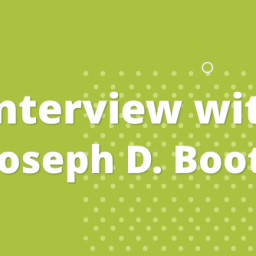 //Set the format as complex script layout type. 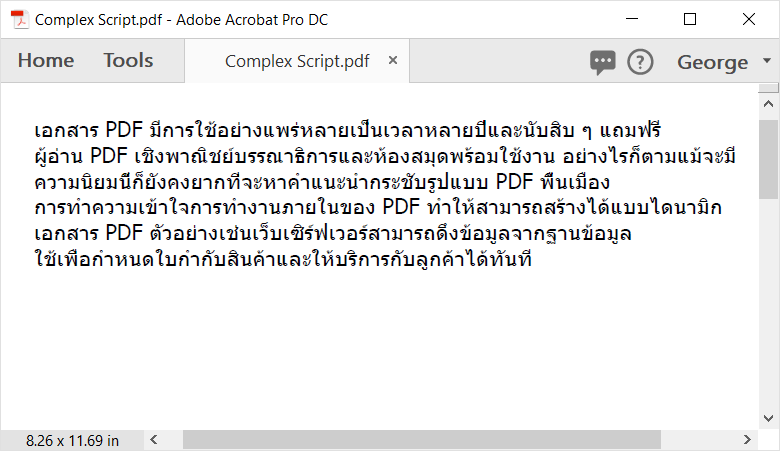 To learn more about adding complex script language text to an existing PDF, please refer to our documentation page, Drawing complex script text in PDF. 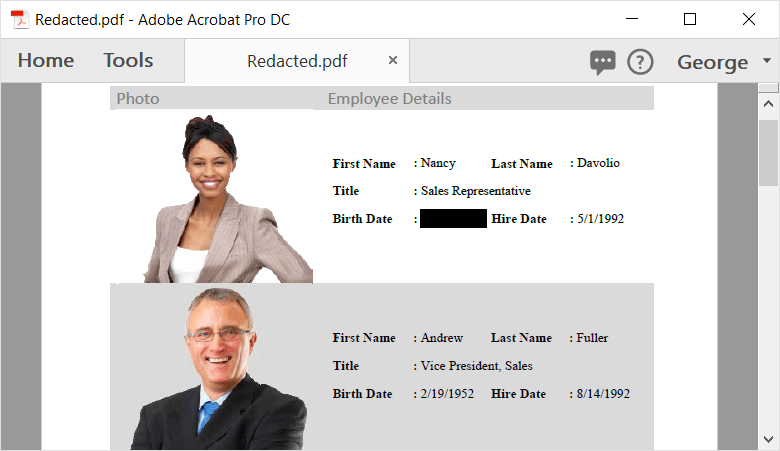 Now you can redact text and images from a PDF document. Redaction is the process of removing sensitive or unwanted content from a document. The following code example shows how to redact PDF documents. //Get the first page from document. //Create PDF redactions for the page. //Add the redaction to loaded page. 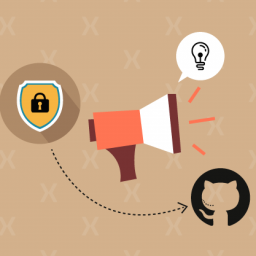 To learn more about PDF redaction, please refer to our PDF Redaction documentation page. 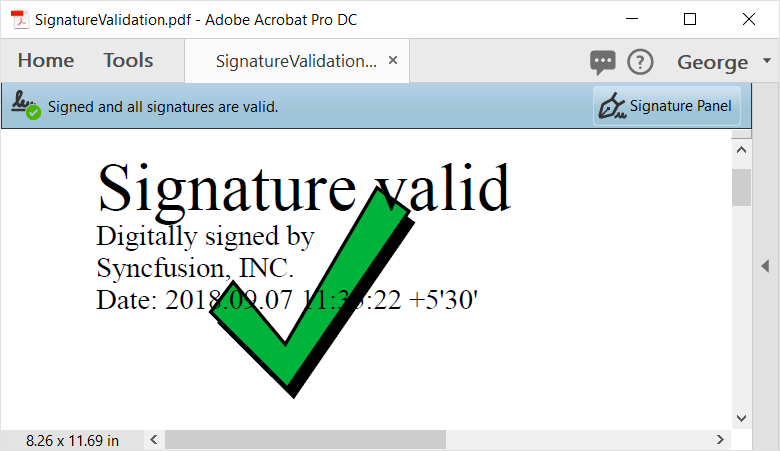 Essential PDF now supports displaying a signature status based on the signature validation in a PDF document. 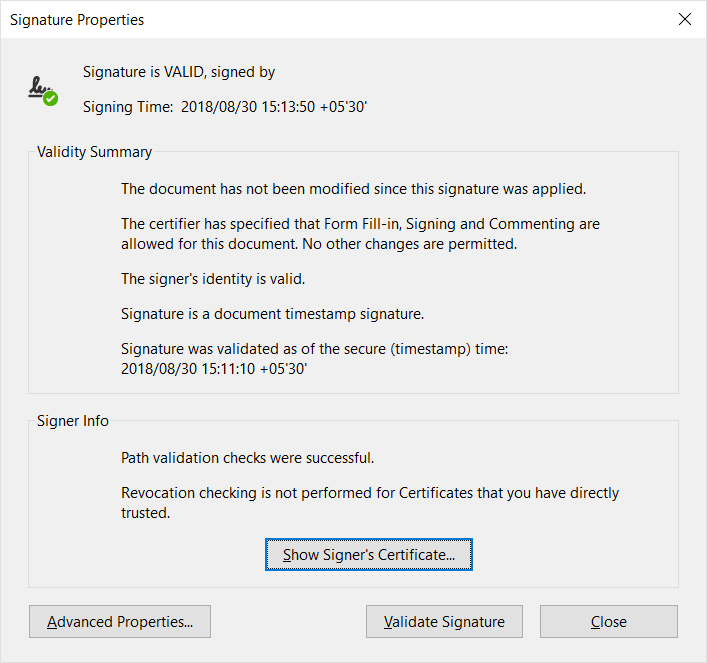 The following code example shows how to enable signature appearance validation. 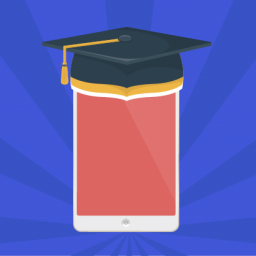 Long Term Validation (LTV) is now supported in our PDF library. 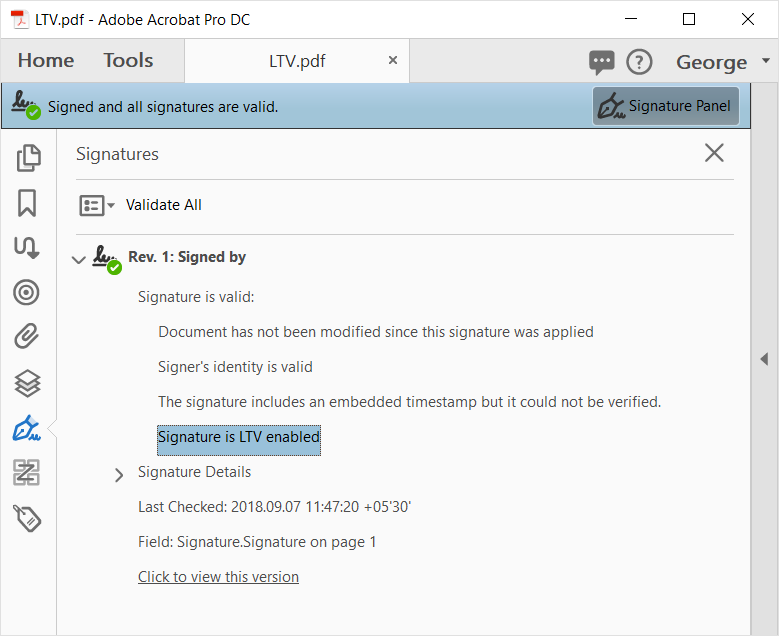 This feature can be used for archiving digitally signed PDF documents and it contains all necessary certificates (a valid CRL and OCSPs) to validate the document. The following code example shows how to enable LTV. //Add page to PDF document. //Sets the bounds of signature. 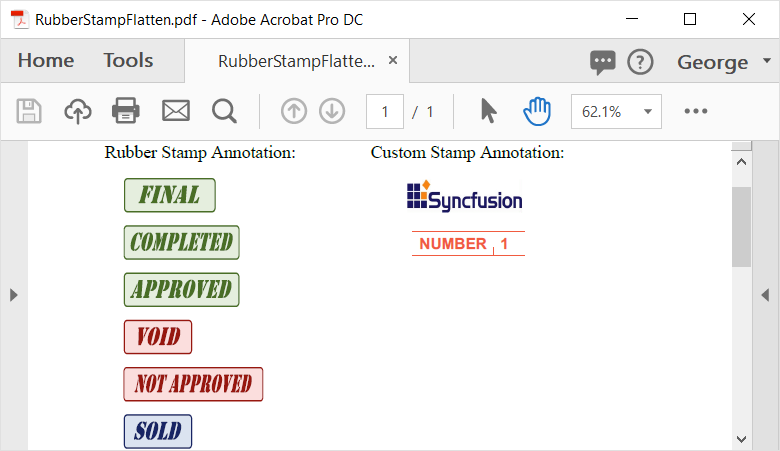 Now, you can flatten rubber stamp annotations in a PDF document to remove their editing capability. The following code example shows how to flatten a rubber stamp annotation. //Get all the annotations in the page. //Check for the rubber stamp annotation. //Flatten the rubber stamp annotation. //Save and close the PDF document instance. 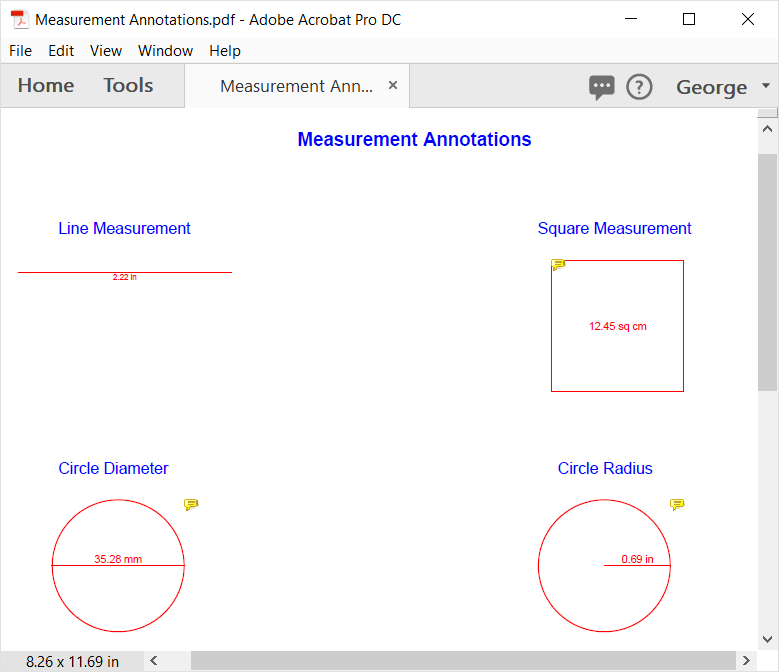 Essential PDF now supports adding measurement annotations (Line, Square, Circle and Angle) in a PDF document. 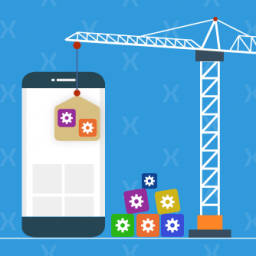 The following code example shows how to create measurement annotations. //Add page to the document. //Creates a new Line measurement annotation. //Initialize the Line measurement annotation. //Set the measurement Unit to display the length of Line. //Add annotation to the page. 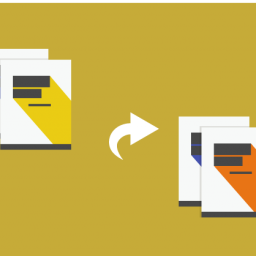 Already, Essential PDF supports timestamping PDF documents when creating them from scratch. Now, this is extended to timestamping existing PDF documents. The following code example shows how to timestamp an existing PDF document. //Add the time stamp by using the server URI. 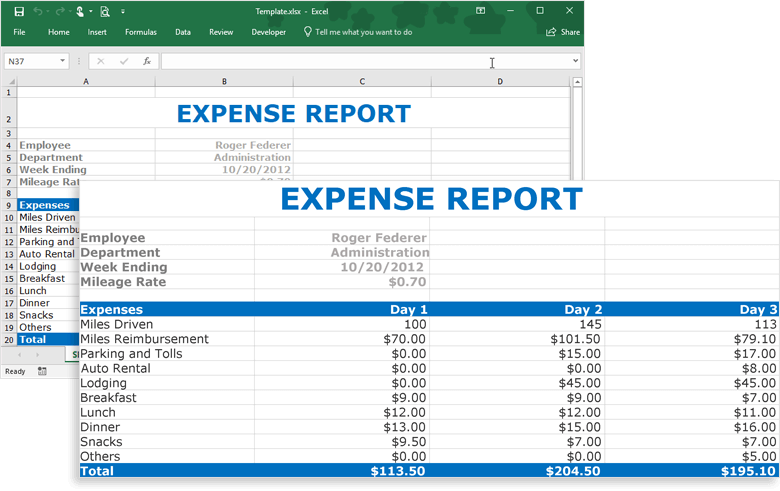 An external cell reference in Excel is a reference to a cell or a range of cells outside the current worksheet. 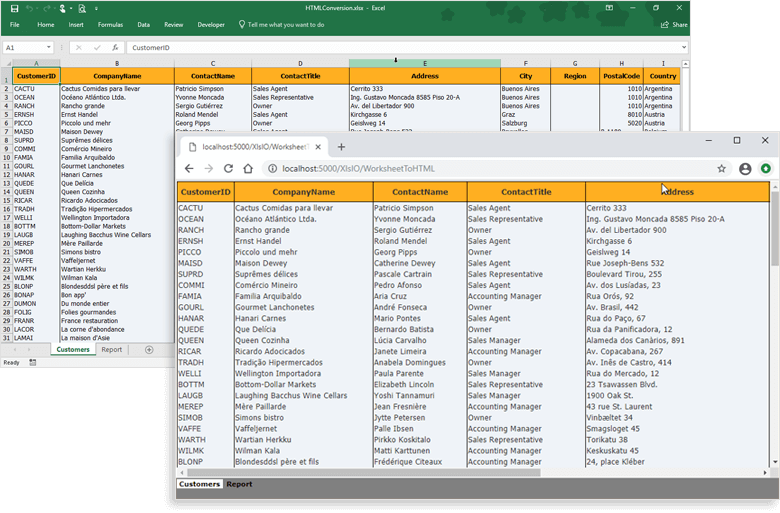 The main benefit of using an Excel external reference is that whenever the referenced cell(s) in another worksheet changes, the value returned by the external cell reference is automatically updated. The following code returns the formula of the cell A1 and its calculated value. Here, the formula references another workbook, which is enclosed in square brackets [Excel.xlsx]. To learn more about working with Excel formulas, please refer to our Excel formula documentation. 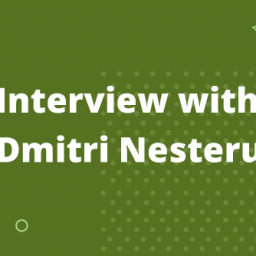 The NuGet packages Syncfusion.XlsIORenderer.Net.Core for ASP.NET Core and Syncfusion.Xamarin.XlsIORenderer for Xamarin are available in NuGet.org. The following code shows how to convert a worksheet to an image using XlsIORenderer. //Open workbook from file stream. To learn more about Excel-to-image conversion, please refer to our Excel to image conversion documentation. The Syncfusion Excel (XlsIO) library extend its support to convert an Excel workbook or worksheet to an HTML file in .NET Core, available from .Net Standard 1.4 onwards. 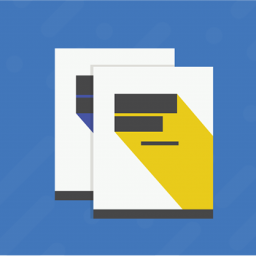 A single worksheet or an entire workbook can be converted to an HTML file. The following code shows how to convert a workbook to HTML. 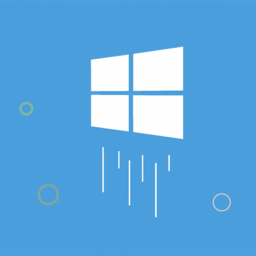 //Create stream to store an HTML file. For more information about Excel-to-HTML conversion, please refer to our Worksheet to HTML documentation. Pivot table allows custom sorting in Excel that helps to sort values by a specific row or column. The Syncfusion Excel (XlsIO) library allows you to sort pivot values by row or column using the AutoSort() method in IPivotField interface. Here, the sorting can be done either top-to-bottom or left-to-right. The following code shows how to sort by value in pivot table. //Save the workbook as stream. Grouped shapes with fill settings and line settings. Images that are recolored in Excel with the options: black and white, color change, duotone, and gray scale. For more information, please refer to our Excel to PDF conversion documentation. URLs and mail IDs from DataTable, Array, or CLR objects used to be imported as strings. With this new feature, these URLs and mail IDs are imported as hyperlinks, as shown in the following image. It is now possible to add hyperlinks to images that are imported from CLR objects (collection). For code examples, please refer to our Importing data to Excel documentation. 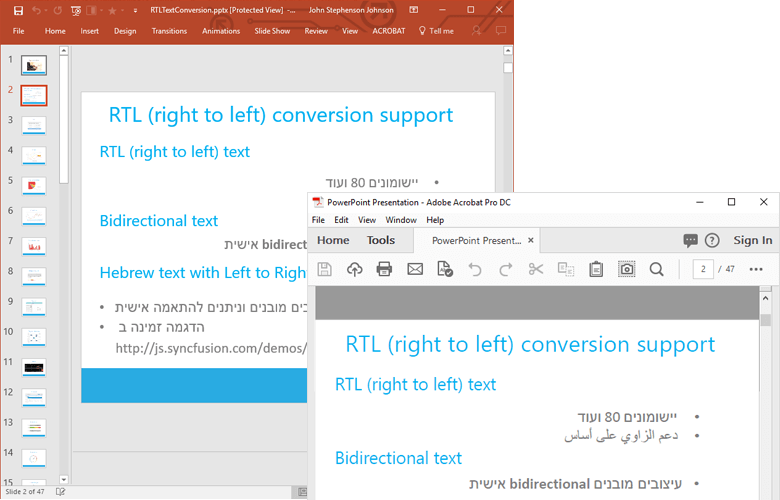 Essential Presentation now allows you to preserve the right-to-left (RTL) text (Arabic, Hebrew, Urdu) and bi-directional (bidi) text in PowerPoint documents while doing PDF-to-image conversions. Please refer to this PowerPoint to PDF conversion user guide for the code examples to convert a PowerPoint file to PDF or image formats. Slide transitions are the motion effects that occur when you move from one slide to the next during a slide show presentation. A transition can be a simple push to the next slide or an eye-catching transition effect. You can control the speed, add sound, and customize the properties of transition effects. For more information, please refer to our user guide page, Applying or editing transitional effects in PowerPoint slides. //Add a slide to the presentation. //Add text to the slide. //Set the transition effect type. //Set the transition effect option. //Set the trigger mode for the transition as after a click. //Set the transition duration value. This specifies the length of the transition. //Set the time delay mode for the transition. //Set the transition delay in seconds. Move to the next slide after this certain number of seconds. 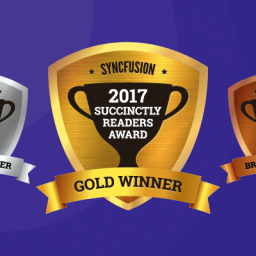 If you are an existing Syncfusion user, please download the new version from the License and Downloads page and try the new features for yourself. 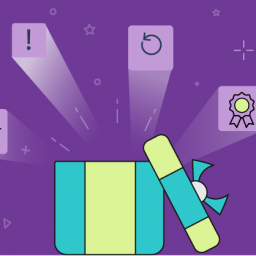 Our NuGet packages are available in NuGet.org, also. 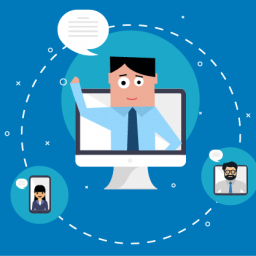 If you are a new customer, you can try our 30-day free trial to check out these features.